This week Walt Disney World made the first two announcements regarding what is coming to the re-imagined Disney Springs. 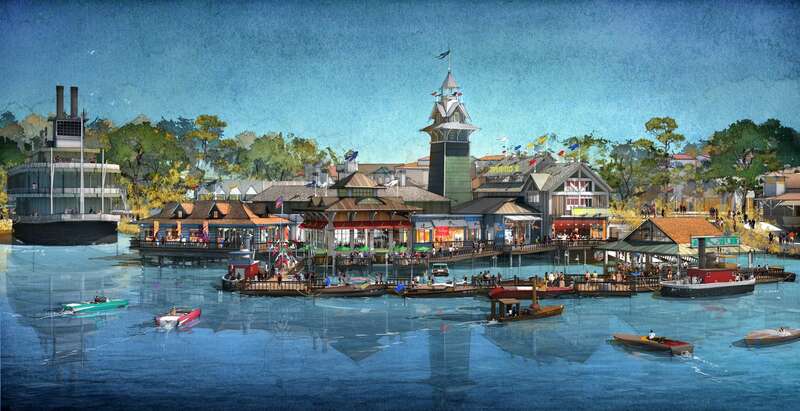 Morimoto Asia and a new dining concept called The BOATHOUSE were announced to be opening in 2015 at the former Pleasure Island location of Downtown Disney. The BOATHOUSE is going to be part high-end restaurant and part attraction destination all in one! Jason got the opportunity to interview Steve Schussler- CEO of Schussler Creative, the creator of such restaurants as Rainforest Cafe, Yak and Yeti, and T-Rex at Walt Disney World- about his newest concept restaurant The BOATHOUSE. The BOATHOUSE will be an upscale, waterfront dining experience featuring spectacular floating artwork: dreamboats from the 30’s, 40’s & 50’s. The restaurant will be high-end restaurant, shop, and attraction all in one! The concept for the restaurant came from Schussler’s desire to make the traditional back of the house waterfront location the front of the house main focus. There will be amazing food, three bars for grabbing great drinks, and some attractions that will make The BOATHOUSE a must-do at Disney Springs when it opens in the Spring of 2015! The BOATHOUSE restaurant will be managed by internationally renowned and award-winning Gibsons Restaurant Group who is celebrated for exceptional food and extraordinary service. Gibsons Restaurant Group was named the best steakhouse in Chicago recently. Guests will enjoy a gourmet menu served daily until 2 a.m. which will feature steaks, chops, fresh seafood and a raw bar. Some of the food options will include cedar plank salmon, fresh fish tacos, and long bone-in ribeye. The restaurant will focus on amazing food and fresh seafood that is not harmful to the environment or their population. Schussler stated that Gibsons has been working on the extensive menu for over a year already to make sure it is perfect for the opening in 2015. The BOATHOUSE will also be known for their 3 distinct bars at Disney Springs. The three bars will include The Captain’s Raw Bar, The Admiral’s Club Bar and The Dock Bar, which will be built over the water. The BOATHOUSE restaurant will immerse guests, both on land and on water, with live music and romantic, Captain’s guided tours aboard The Venezia, a beautifully crafted 40-foot wooden Italian Water Taxi featuring champagne toasts and chocolate-covered strawberries. There also will be the exhilaration of guided Amphicar rides that launch from land, entering the water with a splash, taking guests on a 20-minute tour of the landmarks of Disney Springs. The Amphicars will be decorated with brass, chrome and more and will be a great addition to the restaurant. The attractions will not be exclusive to restaurant guests and can be purchased separately if desired. However, I think this world class restaurant and attraction should be done together! In addition to the rides, the Harbor Master will orchestrate daily flag ceremonies, accompanied by a lively musical performance of beloved bugle songs, performed aboard a classic 1800’s antique steam boat! To see exclusive photos of some of the menu items as well as hear my entire interview with Mr. Schussler, watch the Youtube video below! I know that I cannot wait for this restaurant and attraction to open in 2015. For a while now, we have all been wondering what would take over our beloved Pleasure Island and now we have the answer! I know I am excited about the change and cannot wait to eat there! I would like to thank Steve Schussler for his time! Here are some of the exclusive photos of the new menu items at The BOATHOUSE! So what do you think about the news? Comment below and let me know! Previous Post RA Sushi to host Boo Bash Party for Halloween!